IIFA is one of India’s premier institutes offering courses in a wide spectrum of visual arts. The Institute offers degree courses in Fine Art, including Fashion Design, Textile Design, Painting and Applied Art. Besides permanent faculty, visiting British teachers provide an innovative and inspiring educative experience to our students. In May 2000, Satish and Abha Modi set up the International Institute of Fine Arts, IIFA, an institute that could nurture young artists, ignite their imagination and motivate them in the field of art and design. 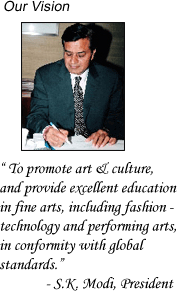 Their vision was to promote art and culture and provide quality education in conformity with global standards. They envisioned IIFA to be a platform that would encourage young artists to create and showcase their creations. All their efforts have led to the fostering of a vibrant atmosphere at IIFA, and today IIFA has over 400 students studying degree courses in Fashion Design, Textile Design, Painting and Applied Art. It is affiliated to Ch. Charan Singh University, Meerut for the four-year B.F.A. course. In addition, the college also offers diplomas in Photography and an advanced diploma in Computer Graphics and 3D Animation. The new Film and Television Institute, being launched soon, will further widen the creative canvas of IIFA. IIFA has international recognition and established alliances with schools around the world. It has MoU’s with the University of the Arts London and the Royal Drawing School, London. Teachers from UK teach at IIFA through the year. IIFA, in association with its educational partners in the UK, is now working towards setting up a world-class comprehensive Fine Arts university – the first of its kind in the country. IIFA is 38 kilometres from New Delhi Railway station. Transport facilities are available for students travelling from Delhi. The Institute is spread over a vast area. It has 70,000 sq. ft. built up space comprising lecture halls; studios for painting and fashion; workshops for textile design and print-making, clay modelling and garment construction; class rooms; computer aided design studios; a library; a counselling and coordination section; a photography department, including dark room; store room; canteen and other utilities. Workshops and guest lectures by academicians, artists and national and international celebrities are a regular feature at IIFA. Several eminent professionals from the field of Art and Design have been conducting interactive seminars and workshops at the college.